Zanele Muholi is a self described visual activist—a gifted photographer who has reached the pinnacle of international art world success with her images of black LGBTI subjects. She is a long-time favorite of OkayAfrica's for the uncompromising politics behind her art and the aesthetic confidence she uses to transmit her messages of inclusion and revolution. OkayAfrica met up with her at the opening of the Zeitz MOCAA museum in Cape Town last month. She is both a major part of the museum's collection. Her art takes up a large chunk of the gallery space, yet in the launch ceremony she stood apart—preferring not to take part in the artist group presentation in what seemed like a very conscious decision not to be used as a prop for the museum's marketing. We spoke to Muholi about her work with the Zeitz MOCAA and the politics of inclusion in the South African art landscape. OkayAfrica: How involved were you in the creation this institution? 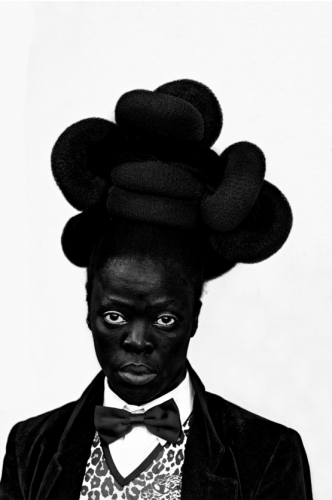 Zanele Muholi: I'm just a contributor. I was requested to be part of this and then I have my show which is partly collected by the museum and I also donated a print to fundraise for this space. Was that important to you on a personal level? I came on board as an artist who portrays black LGBTI people. So, my being here is more political than anything else. It basically means that if we do not see images of black LGBTI people as members of the community, that we need to bring forward the visuals of our people. So we won't say we were left out. It was very important to contribute towards a system that I believe in, supposedly. And it means that if I do not contribute, most of the people who are members of my community won't be able to have access to this space. I have to make sure I'm hands on in many ways. The gallery requested a print, I donated. The gallery then collected some of my work, which then becomes a two way thing because that is much needed anyway. Right. That's what you mean by access? Yes, yes, yes. Contribution. Access to the people. Let the black LGBTI people have a reason to come to the museum, because if they are not there, what will they be going there to see? I want to make sure that they come to a space in which they see themselves or see the members of the community of which they form part. We cannot only exist when it's Pride. It means that even as much as this museum is mainstream, it means that we're "queering" the space in order for us to access the space. We transition within the space in order to make sure that the black, trans bodies are part of this as well. We owe it to ourselves. Right. What did you think about the museum's claims that they were reaching out to the local community? Do you think that goes far enough? Okay. I studied in Toronto. So I know of Canada and that question is important to both of us. Knowing what Canada is all about, it shouldn't be just about South Africa speaking on the politics of access in terms of art or anything, because Canada is divided. Canada has the social ills that South Africa has surely. In some ways we're better off than Canada. You know? You have your own people who are excluded! The first people of Canada, who are in the North of Canada, who can't access your Toronto, who were even excluded when you had Olympics in Canada. That is a painful question. The issue of access in this country is doable, speaking of Capetonian communities, because you're speaking about a vast space. Which means that each and every region should have a functional museum where people in those spaces make sure that they take care of those who are on the margins of society. We owe it to ourselves. You have a lot going on in Toronto, but you don't have a lot going on in Alberta for instance. You have spaces in your own country that are so racist, such racism that you won't even deal with. I lived in Canada, so no American person or European person can ask me or say anything about access to any space because this is accessible. Speaking as an activist, if I say—assuming that we both come from South Africa—you had a panel of artists who were seated there. Surely they have some resources, if we speak on access and possibilities it means that each and every one of us could donate. Now I'm coming on to a solution. How we could bring access to any space. About ten artists were seated in front. I wasn't in the front, by choice. Each person brings 100 people, so if there were ten artists seated in front, each and every one of us were to bring 100 people every month it would mean that we have done good or justice to members of our community. It means that if we were to connect with the arts and culture department and say there's a new museum that is open in Cape Town, we want people from our townships to access this space in order for them to see our work, it will be possible. This space is one of the major spaces in Cape Town. And talking about in-access to this space means a lot, but it means that it could be dealt with accordingly. There's the mountain, there's Robben Island, there are many other tourist attraction spaces in which we could bridge that gap. So we owe it to ourselves to make sure that this museum does not only end up being a white space, but a space for everybody who lives and works in Cape Town. Yes, we have a responsibility and we cannot make excuses. It shouldn't be only for artists—it's a public space. There are free programs. There is a solution in place, which means that every artist who cares about this and wants to see this place progress, we bring someone in here. Let them be educated around our work. Not only about my work, but another artist's work and also to read about African artists that are unknown to them. Let's preach to the masses—it's doable. So, the responsibility is as much up to the community as the institution? Artists who are showing here have a responsibility to mobilize. We cannot rely on the Zeitz Museum to do it for us. We want our people to be educated around art and the art of those around us. Therefore, we should make sure that we bring some people here. Everybody knows one. Bring that person in your family who might not understand what art is all about. It shouldn't only be Zeitz MOCAA. Stop complaining and take action. Action, action... Action means possibility. Action means it's the way to go and people get to mobilize and people get to learn and read about new concepts or knowledge. It's doable. What are some other ways your work brings about change? For me, my being in any space is about taking care of my black LGBTI people. We need to be everywhere. And when we do so, we need to do it strategically and with pride. And when I come to the spaces, I'm not coming alone. I'm coming with members of my community and it means that we have seen Faces and Phases. There are more than 20 faces within that space and it means that 20 black lesbian and trans people are here. Not Zanele only. Then there is a space that is allocated for me, with my self portrait which speaks on the importance of self-representation. And speaking also on the topic of race, in terms of Cape Town, in terms of South African contexts and also the past in which all experience as people who are born within a certain period of time. But it basically said that if you don't see yourself in any space, create some content that will then speak to you and your community and share thyself to many people and say it's okay for you to look at yourself, so that other people will learn on how they embrace themselves, especially as black people. Zanele: I have a solo show on at the Stedelijk Museum in Amsterdam and I happen to be the first black, female queer who's showcasing there, ever since they opened that space. No, no! It's not even about congratulations. It means that we need to intervene when such absence occurs. So for me it's not even about being the first one, but it's a point. And also for me entering that space consciously. Making a statement for other black, female Africans to know that that space is possible. It's the same thing that I did with Brooklyn Museum and also, currently I'm at Autograph in London. Which also has a lot to do with black chronicles, etc, etc. I'm penetrating spaces that were seen to be impossible before and not doing it alone. Alongside my peers, who feel like me, who love the same journey. What can we expect next from you artistically? What are the next sort of projects you're going to be involved in? My work is visual activism. I happen to be in art spaces because they have opened up their doors to me and members of my community. What's next? I'm working on "Brave Beauties," which is a series of black and white portraits of trans-women that I have been working with for some time now. Publications are key, because somebody once said if you are not published, it means you perish. So by choice I need to make sure that my work is published, to have something tangible that will live beyond me.